The son of Union General Philip St. George Cooke and the brother-in-law of Jeb Stuart, Cooke became a capable brigade commander in the Third Corps. Born at Jefferson Barracks, Missouri, on June 9, 1833, he was educated at Harvard, then directly commissioned into the US Army in 1855 as a second lieutenant, Eighth Infantry. When Virginia seceded, Cooke and Stuart chose to go south, while his father stayed loyal to the Union. The breach in the family was not healed for some time after the end of the war. Cooke was elected colonel of the Twenty-seventh North Carolina Infantry in April 1862. Cooke was apparently wounded at Sharpsburg, but he did not leave the field. He was made a general on November 1, 1862. 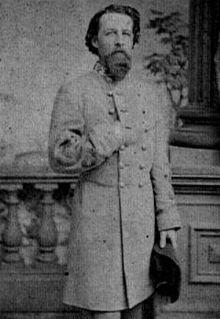 Cooke was one of those Confederate generals, like Dorsey Pender, who was often wounded. Soon after receiving his general’s wreath, Cooke was very badly wounded at Fredericksburg on December 13, 1862. The bullet entered over his left eye, and although the blow was glancing, it fractured Cooke’s skull. Cooke was able to return to the field by April 1863. He was badly wounded again in the Bristoe Station debacle. This time his shinbone was shattered. He spent some time doing courts of inquiry in Richmond while recovering. Returning to duty before the spring campaign, he was again wounded in the leg at the battle of Spotsylvania but still led an attack on horseback. All told, Cooke was probably wounded about seven times. This, as well as his outstanding record, attests to his deserved spot as one of the Confederacy’s most capable and best brigade commanders. After the end of the war, Cooke became a merchant in Richmond. An active member of the community, he was one of the founders of the Confederate Soldiers’ Home in Richmond. General Cooke died in Richmond on April 10, 1891. Sources of information: Eicher, John H., and David J. Eicher, Civil War High Commands. Stanford: Stanford University Press, 2001. And Then A.P. Hill Came Up: Biography of John Rogers Cooke.